Enable your customer service reps and helpdesk personnel to book appointments while resolving support tickets, with this handy Setmore plugin for Zendesk. 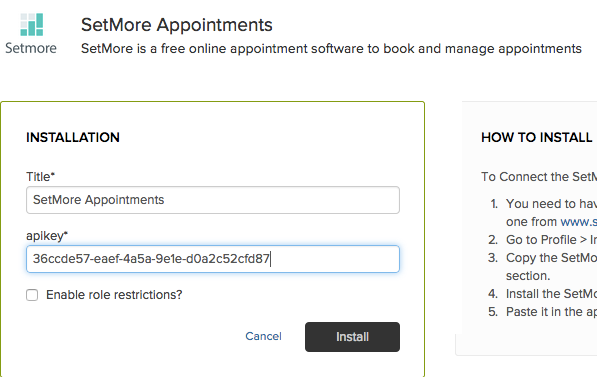 Once deployed, the plugin will add a "Book Appointment" window to the Zendesk dashboard that syncs with your business Setmore account. Reps can book appointments for services and the calendar in your account will be updated instantly. 1. 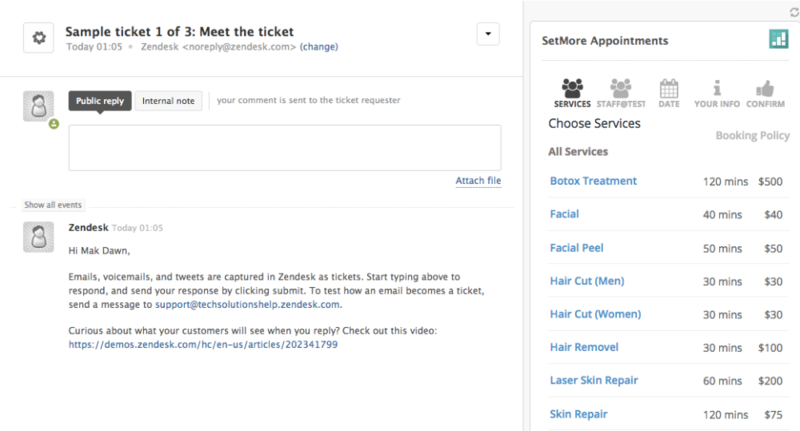 In Setmore, navigate to Apps & Integrations, then scroll down and click the Zendesk integration card. 2. In the Zendesk details menu, find the Setmore Key and click the "Copy" button that appears next to it. 3. Open Zendesk in a new browser tab. Navigate to the Apps Marketplace and search for "Setmore Appointments." Click the Setmore app to begin installation. 4. When prompted, paste the Setmore key that you copied in Step 2 and click "Install" to complete the installation. When responding to customer tickets, your Setmore Booking Page will appear in a right-hand sidebar. Your agents can now start booking appointments directly from their dashboard.